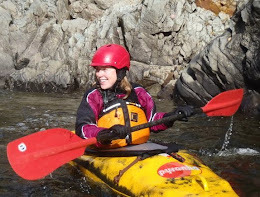 Last weekend, Kim Ward-Robberts, Chris Gee, Luke Boserio and myself made the trip west for 3 days of playboating on Butze rapid. 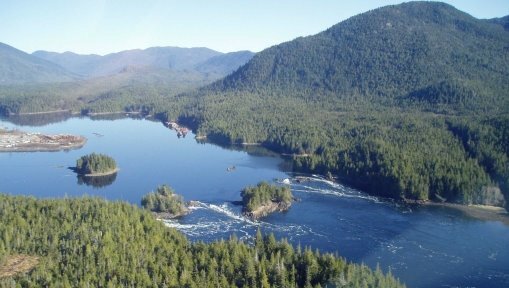 Located near Prince Rupert, Butze is a reversing tidal rapid created by the differential currents in the ocean passage around Kaien Island on the west coast. 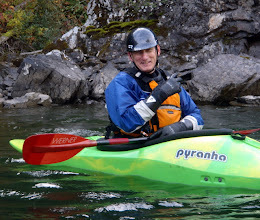 Unlike Skookumchuck which has one main wave, Butze has several playwaves, holes, and rapids that come and go as the tide changes. Below is an aerial shot of Butze Tidal Rapid. Having heard a lot about how great the surf is from local boaters in the northwest, and being pretty tired of winter in the BC interior, we were all pretty stoked to get out of town and get on the ocean. After some minor mechanical delays, we rolled into Rupert pretty late. Big time props to Gee for driving!! Next morning we finally got on the water. If you time it right and show up when the tide starts to change direction, things start to happen fast. Here's local ripper Jake Palmer on the first surfable wave that forms at Butze. The next wave is an awesome diagonal in the surfer's right channel that also forms the biggest and gnarliest surf wave at Butze called Hawaii Five-O. For our trip, the tide difference wasn't big enough to set up this monster. Here's Luke on the diagonal wave. After the 5-0 channel does its thing, the "Cradle of Love" begins on the far left channel. This is definitely where the best surf is and where all of us had our best rides. Several different waves form up at different times here, so once it begins it's non-stop action. Shots below are from the Cradle. For accomodations, we stayed in the dormitory at the Pioneer Hostel, pictured here. Not a bad spot and pretty comfy even if the kitchen was a little small. Next time, maybe we'll be crashing at one of these jokers pictured below. Here's Jake and Kirk --- our Rupert welcoming committee. Sunday night we were looking to get into some trouble, hitting up a couple local pubs, but only Luke the young gun managed to pull a late-night. Way to represent Luke! Once the cradle disappears, there's another hole that shows up in the next channel that Terrace local Jason Cathers showed us on our last day. "Is it sticky?" I ask (long pause) "ummm, well...". And that was how I had my first windowshading experience. That's all from Butze. There might be some action film footage yet, and more pictures so stay tuned. Otherwise, Easter long weekend anyone?? 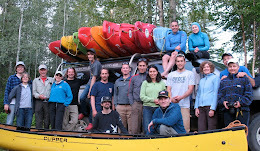 The Northwest Brigade Paddling Club is based out of Prince George, BC. Need more information? Post your questions on our forum on the club pages link below.